In November of 2013, the scholarly Ken Dryden opined: “The case for hockey fighting gets weaker and weaker. For fighting’s supporters to make their case they must twist logic and twist it again to fit the conclusion they’ve already arrived at”. The knee-jerk response to that is, of course, that the gentlemanly barrister prefers reasoning to right hooks—so what else could he say. Such incites prompt digging into the game’s archives on the subject, and, besides uncovering countless examples of the services of key players lost due to fisticuffs, reveals the personal demons of players whose role in the game was being an enforcer. Despite a rather lengthy introduction, this column is not intended to chronicle the pros and cons of the place (or lack of same) fisticuffs has in the world’s fastest sport. The opinion of this writer (which is probably obvious by now), or that of those on the same page, will NOT rid this fine sport of boxing and wrestling on ice. Instead, we intend to offset its negative elements, by sharing several instances of FUNNY FIGHTS—those which may prompt anything from a quiet chuckle to a healthy belly laugh. We’ll just pause here to acknowledge that the body of this missive was already completed before yours truly chanced up several instances of You Tube’s “Funny Fights”. Of the five featured in this clip, a bout between Brad Norton and Aaron Downey on April 6, 2006 takes the cake. It amounted to a “waltzing Matilda” spectacle. For what seems like at least three minutes they did nothing but circle around, facing one another in a pugilistic stance at arm’s length, without ever attempting to throw a punch. Finally, the linesmen, who no doubt were getting dizzier by the minute, stepped in and stopped the charade. One of the first instances of a sparring match takes us back to 1910. The NHA included two franchises from the mining district of Northern Ontario, Cobalt and Haileybury. Childhood friends, Art Ross and Lester Patrick found themselves in the role of opponents when Renfrew visited the Haileybury for a frosty midwinter confrontation. The former was sporting the colours and the captaincy of the former club—PLUS a pair of fur gloves and a woolen toque pulled down over his face with peep-holes cut out for the eyes. “King” Clancy confessed that he probably won only one hockey fight in all his years as a super pest in the NHL. According to his recollection, it was against Eddie Shore. He smacked the “Edmonton Express” as he was getting up off the ice and skated like mad as far away from his victim as he could. It is common knowledge that he started countless battles but someone else always had to rescue him. One night in 1932, the Leafs were the Maroon’s visitors in the Montreal Forum. He and big Harold Starr, who had once been teammates in Ottawa, got into a spirited tiff. Both were fined $25 for their part in the brawl, and Starr was suspended one game—since it was his third major that season. As usual Harold got the better of the punch up, and, as the report put it: “After Starr had mopped up the ice with the King, he sat on him. ‘Lemmee up! Lemmee up!’ the diminutive Clancy shouted! After what seemed like an appropriate time to affirm victory, the squirming leprechaun was released. Several years later—in January 1953 to be exact—two players of totally opposite personalities became involved in a confrontation. Dunc Fisher, who was with the Bruins at the time, averaged only about 20 penalty minutes a season, and was a stranger to the fight scene. But on this occasion the feisty Gord Hannigan of the Maple Leafs kept pestering the peace-loving winger. “Hopalong”, as he was sometimes called, eventually prodded the smallish Beantowner with his stick. Instead of taking the normal initiative in retaliation, Dunc simply reached out and grabbed the stick from his aggressor’s grip. Hannigan was so astonished at this reaction that just stared for a time—then asked for it back! 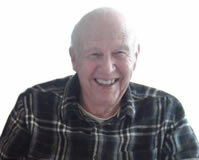 Edgar Laprade was one of hockey’s “Mr. Clean” types. During ten years of NHL competition he totaled only 42 minutes in the box. Three times during the course of a 70-game schedule he wasn’t called for a single foul. But in 1952 big Gus Kyle, a one-time former teammate, prompted the normally mild-mannered Ranger to lose his cool. As they clashed, Edgar let go with five rapid-fire punches, which caught the former RCMP officer totally off guard. In fact, he was so surprised he didn’t reciprocate! In 1955 Al Arbour was still apprenticing in the minor leagues, manning the defense corps for the Edmonton Flyers of the Western (Pro) Hockey League. At the same time Jack Bowness was skating with the Seattle Americans of the same circuit. Both wore glasses. In fact, Arbour was called “Radar” and Bowness was tagged as “Magoo” (after the famous cartoon character, “the near-sighted Mr. Magoo”). Although the latter had shed the specs by the time he got to the big leagues, on this occasion they were both still “four eyes”, and they got into a row. As they started to push and shove, both lost their cheaters. Being that their common denominator was poor eyesight, when they continued their scuffle it was a comical sight to see them standing a few feet apart, throwing punches, which really amounted to nothing more than “shadow boxing”. The blows landed in empty air, while they challenged one another to come out of hiding. In the late 1960’s Pete Mahovlich and Gary Unger were teammates in Detroit. However, the former was traded to Montreal, forcing them to become opponents on the ice. During a subsequent meeting of the clubs, “The Little M” had disposed of the Blues’ Jimmy Roberts, and Unger decided to avenge his fellow Missourian, and he went after him swinging. However, it all came to nought—as the big guy simply reached out his long arm, grabbed Unger by the blond mane, and held him at bay till he stopped struggling. Later in that decade, as the WHA was gradually petering out as a major league, a little-known bruiser by the name of Dave Hanson of the Birmingham Bulls, goaded Winnipeg’s Bobby Hull into a wrestling match. In the process of grasping for leverage, he accidently latched onto the “Golden Jet’s” hair weave. As surprised as Hanson’s expression was, it could not compare with the deadly silence which overcame the spectators in the arena, as they looked down at their nearly-bald superstar, staring at his assailant, who was still clutching the recently-removed scalp! In March 2001 the belligerent Tie Domi, then with the Maple Leafs, got into a ruckus with a fan in Philadelphia—one Chris Falcone. He had been laying verbal abuse on the Toronto tough guy all evening and, when Tie ended up in the penalty box, two rows in front of the leather lung, it was just too much for him. His increased cat calling was met with a healthy stream squirted from the sin bin’s water bottle. Falcone leaped from his seat and tried to scale the partition separating the spectators from penalized skaters. His weight and the force of his leap, caused the glass to give way—and he ended in the box, up face to face with his nemesis. Dome pulled his stalker’s sweatshirt over his head and landed a few good punches. It all ended when a linesman stepped in and put a stop to it. Perhaps the icing on the cake when it comes to comical confrontations must be reserved for a skirmish which climaxed the year 2014. 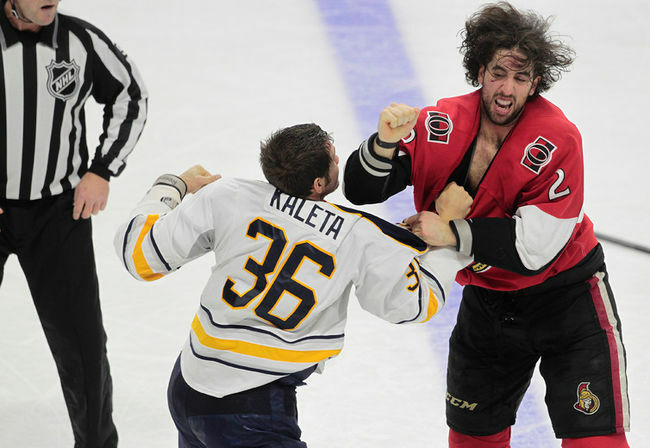 On December 31st, Buffalo’s Patrick Kaleta was reported to have PUNCHED HIMSELF during a rumble with Ottawa’s Jared Cowen. Apparently in seeking to block a punch from his opponent his fist inadvertently clubbed his own face. So now—as the old saying has it—we’ve heard everything!